Traffic control is a growing industry as more roads are being built and repaired. Traffic controllers create traffic patterns for partially-finished roads or roads that are undergoing repair. Each state has different laws about how roads under construction are to be used, and traffic controllers must be familiar with the laws of the state in which they operate. Traffic controllers must pass a state exam illustrating their familiarity with state law and their ability to create safe and sound traffic patterns around road construction. Sign up for and attend a traffic control class for your state. Generally, you can find information about upcoming courses from your state's department of transportation. Course length ranges from a few days to a few weeks depending on the state. Students learn the traffic laws of the state in which they reside and learn about the standards of traffic control such as how to re-direct traffic during road construction. Name and register your company with the state government in which you passed your traffic control exam. Generally, you must register your company with the secretary of state. You may need to provide documentation regarding your scores on the traffic control examination. Certify your business with your county or city, if necessary. Some counties and cities do not require traffic control companies to be certified, but taking the certification course illustrates that your company knows local traffic rules and regulations. Purchase safety gear, road signs and road safety equipment, such as cones, once your business is registered with and recognized by the state. 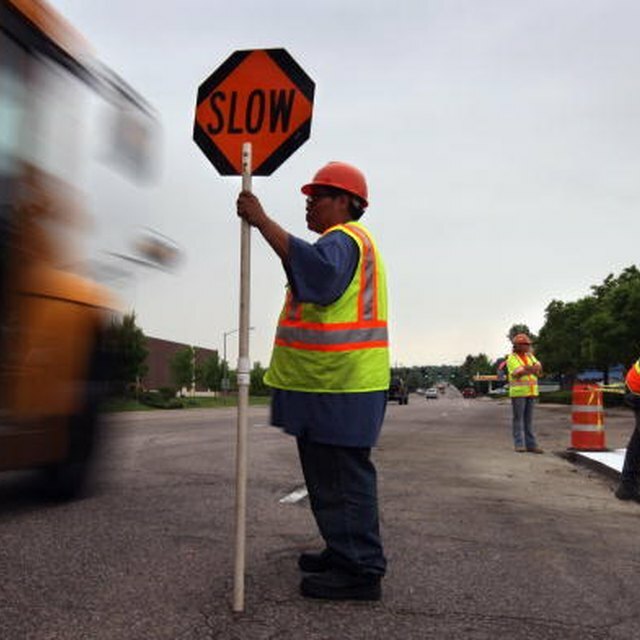 Each state has varied requirements regarding how road crew workers are supposed to dress and what kinds of signs and objects are required to notify drivers of changing traffic patterns. Make sure you have all the correct materials to start a job. Advertise your business with your local Chamber of Commerce. Also, reach out to construction companies and your local and state government who probably need traffic control contractors for road work projects. Always create a business plan in writing to refer to when you have questions about what to do next. A business plan is a great reference and a way to guide your business in its infancy. Refer to the Resources section for a guide on how to create a business plan. Before going ahead with your business planning, make sure you are familiar with the other traffic control companies in your area. If they charge less or have another competitive edge such as lower prices, your business may not be as successful. Know your competition and think of ways to rise above the competition before moving ahead with your business plan.